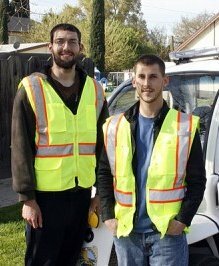 The City of Newman is upgrading its geographic information system (GIS) and Stanislaus State Geography students Joseph Randis and Frank Guillory are there to help! For the fifth year in a row, Stanislaus students win awards at the statewide California Geographical Society (CGS) Meeting. Criminal Justice major Samantha Felice won first-place in the undergraduate competition for her paper Spatial Fluctuations in Crime by Season: An Ode to Quetelet and the Green Crime Paradigm. Her faculty mentor is Dr. Gregory Morris.Geography major Melissa Ball won third-place in the digital cartography competition for her interactive map entitled Stanislaus State Online and Interactive. Her faculty mentor is Dr. Austin Avwunudiogba. Geography majors Aldo Garcia, Michelle Machado, and Natasha Hanley (MAIS) each won travel awards to attend this years conference at University of California, Davis. Founded in 1946, the California Geographical Society (CGS) is the oldest and largest state-wide organization devoted to enhancing the understanding of geography and promoting interaction amongst academic and applied geographers, as well as members of the general public who share an interest in geography. The organization hosts an annual conference each spring drawing over 400 professional geographers from around the state. http://www.csun.edu/~calgeosoc/.